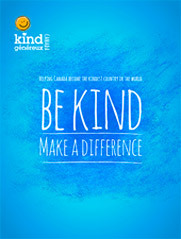 The mission of the World Kindness Movement organization is to inspire individuals towards greater kindness and to connect nations to create a kinder world. 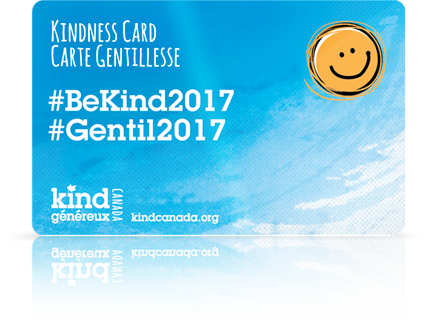 In June 2015, Kind Canada Genéréux proudly became a member of The World Kindness Movement (WKM) while attending the 8th International WKM Council Meeting in Avignon, France. The World Kindness Movement is the peak global body and international non-government organization with no religious or political affiliation. Its chief objective is to foster goodwill among the broad community – local, national and international – by way of kindness, and in so doing, create greater understanding and co-operation between all people and all nations throughout the world. The idea behind the World Kindness Movement crystallized at a conference in Tokyo in 1997 when the Small Kindness Movement of Japan brought together like-minded kindness movements from around the world. The World Kindness Movement was officially launched in Singapore on November 18, 2000. Today, the World Kindness Movement brings together a worldwide coalition of kindness organizations that study and promote improved individual and collective human behavior. Current members include over 24 nations, with representatives from Australia, Brazil, Canada, China, France, India, Italy, Japan, Nepal, Netherlands, New Zealand, Nigeria, Oman, Thailand, Romania, Scotland, South Switzerland, South Korea, United Arab Emirates, United Kingdom and the USA. If you’d like to find out more about the World Kindness Movement click here to visit their website.